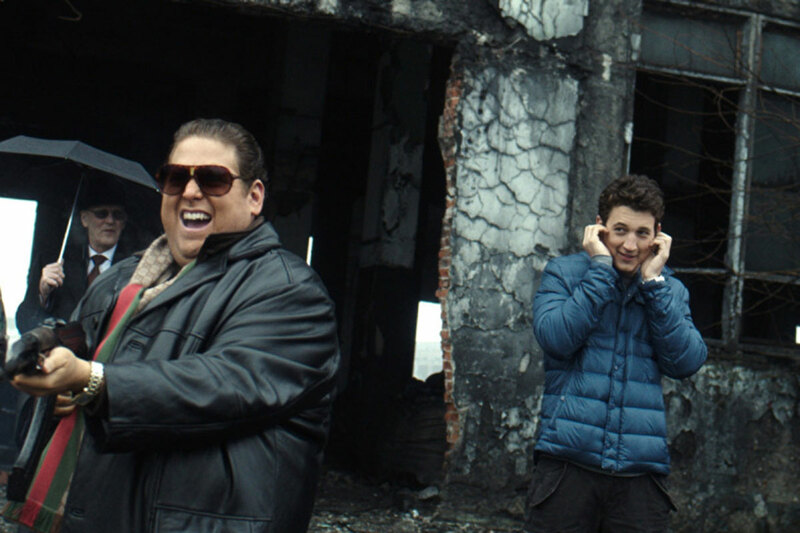 War Dogs is an extremely entertaining drama filled with great comedy from both Jonah Hill and Miles Teller. It attempts to emulate great films like Goodfellas and Scarface, but doesn't quite reach its potential. Still it will be one of the best movies you'll catch this year. If I tell you that two of my buddies made it big by bidding on U.S. military contracts, you probably wouldn’t believe me. Well, thats exactly what happened back in the mid-2000’s when partners and childhood friends David Packouz and Efraim Diveroli start living the high life by selling weapons to our military during the Iraq War. War Dogs tells the story of of David and Efraim’s rise and fall in the military contracts business plus every crazy bit in between. David Packouz (Miles Teller) is a mid-twenties massage therapist in Miami. While he makes a decent amount of money, David is ultimately empty and seeks a way to get rich and provide for his girlfriend, Iz (Ana de Armas). In his quest for cash, David runs into his childhood best friend Efraim Diveroli (Jonah Hill). While David has been rubbing naked men, Efraim has been selling weapons to the U.S military and making a pretty penny. David decides to join Efraim and the pair smuggle, cheat, and “BS” their way to a $300 million deal known as the Afghan Deal. At the edge of fame and fortune, David and Efraim encounter some truly bizarre situations that will really make you question how on earth this ever happened. I wasn’t expecting much from War Dogs. Director Todd Philips is best known for the Hangover trilogy which, while entertaining, I would hardly call cinematic gold. That is NOT what you get in War Dogs. Instead, Todd Philips delivers an intense drama with strands of great humor. The film feels similar to The Wolf on Wall Street and Goodfellas. What do those films have in common? Martin Scorsese. Todd Phillips channels his inner Scorsese in film direction and editing. What really draws me to War Dogs is its premise and the incredible actors leading the action. While Miles Teller has had very bad luck lately (ie. Divergent Series, Fantastic Four), I think its safe to say that this man can really bring it when it counts. If you have every seen Whiplash, you know Miles Teller is capable of delivering an incredible performance. Alongside Teller is two-time Academy Award nominee Jonah Hill. While Jonah Hill is also very well known for The Hangover, he has really grown past being the the “gag” in a story. In both The Wolf on Wall Street and Moneyball, Hill really pulls out stunning performances and you can now add War Dogs to this list. Both Miles Teller and Jonah Hill give stellar performances as David and Efraim respectively. While David is a mild-mannered massage therapist, Efraim is an erratic and often creepy egomaniac. Their contrasting personalities drive the story forward as David is hooked deeper into the crazy world of Efraim and his arms dealing ways. Also, lets not forget a gratuitous cameo to Bradley Cooper who stole every scene he was in. War Dogs isn’t only a wildly fun look into these real life events, but it takes time to address the very clear moral ambiguity of our political arena as well as our personal self. Maybe David wouldn’t have to get into the gun running business if finding honest work was much more beneficial. Maybe men like this wouldn’t exist if the U.S. Government actually cared even a little. Many of the underlying lessons in War Dogs adds a weight to an otherwise fun story. Some of my concerns with the film are with the story itself. While War Dogs is extremely entertaining, it feels extremely biased toward one-side of a two-side story. This film was produced in collaboration with the real life David. Efraim is trying his luck with a novel detailing his version of the story. David is portrayed as a completely innocent individual and its hard to believe how true that is. The film also focuses heavily on David’s story while Efraim is clearly the more compelling character. This is especially apparent at the end which almost exclusively focuses on David and causes the last 30 minutes to drag on for a bit. War Dogs presents an extremely entertaining film with compelling performances from talented actors. Director Todd Philips really surprises with a film that is out of his usual wheelhouse. War Dogs does its best to emulate films like Scarface, The Wolf on Wall Street, and Goodfellas but doesn’t quite stick the landing. The end is especially problematic as it hastily tries to tie a neat bow on several subplots. Still, in a summer filled with many let downs, War Dogs will probably go down as one of the better films of the year.